Amazon will be allowed to help its customers in South Carolina dodge sales taxes, after all. 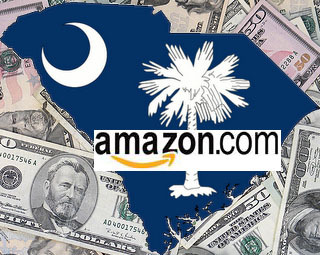 In a dramatic reversal, Palmetto State legislators approved a bill that gives the online retailer a five-year exemption from collecting sale tax from the state’s residents. The move revives Amazon’s plans for a $125 million distribution center in the state that is projected to create 2,000 jobs. Unfortunately, the bill does not include strong clawback provisions. The legislation is a defeat for Amazon’s brick-and-mortar competitors, both small businesses and big-box retailers such as Wal-Mart that lobbied hard against the exemption sought by Amazon. As we previously reported, the original promise to exempt Amazon from its obligation to collect sale taxes was made last year by then-Gov. Mark Sanford and was a part of a subsidy package that included $5 million in free land; $3,250 in tax credits for each job created; and property tax breaks on equipment. Initially, the House rejected the deal but gave into political pressure stoked by Amazon’s decision to increase its job-creation projection by 750 jobs. Gov. Nikki Haley has opposed the deal, though she now says she will let the bill take effect without her signature. Limited attention is being paid to the terms of the company’s job promises. The final version of the bill requires Amazon to create 2,000 jobs by the end of 2013 and retain 1,500 jobs between the end of 2013 and January 1, 2016. If the company decides to lay off up to 500 workers after 2013, it will face no consequences. After January 1, 2016 (when the exemption expires), Amazon is not required to retain any specific number of jobs. If the company does not meet job creation or investment ($125 million) obligations, the only penalty Amazon would face is cancelation of the exemption. There are also no wage requirements for the jobs, though Amazon is required to provide a comprehensive health plan for the workers. It is disappointing that after the long battle, the legislature did not put measures in place that would truly protect workers and hold Amazon accountable.